What are the Section 24 Tax Changes affecting Buy-to-let Landlords? Section 24, Finance (No.2) Act 2015 restricts the tax relief available in tax years after April, 2017 for mortgage interest paid by landlords on buy-to-let residential properties. Basically, it makes running a buy to let portfolio much more expensive and can even push you into a loss depending on how high your borrowings are. I will look at the numbers in a minute after considering the reason for the change. Simple. The Chancellor, at the time, George Osborne, decided to make it much more expensive for individual landlords (as distinct from company landlords) to own and operate buy to let portfolios by limiting the tax relief they get for the interest they pay on loans to acquire buy to let properties. He did this because he wanted to discourage buy to let landlords from snapping up the types of residential properties that are suitable for first-time buyers. He hoped that this would lead to less price competition and give first-time buyers a better chance of getting onto the housing ladder. A laudable aim, but the evidence suggests that while buy to let landlords are now as a result, dumping properties into the market and so bringing asking prices down, those landlords who are sticking it out are raising rents in a letting market that is beginning to see the supply of rental properties restricted, in order to cover their lower after-tax profits. What is the Section 24 Restriction? Landlords are no longer be able to deduct all their interest costs from their rental income in order to arrive at their taxable profit. Instead, they get a reduction from their income tax bill equal to only the basic rate of tax (20%). This change is phased in between 2017 and 2020. In 2017/18, you got 75% of interest costs allowed in full with the remaining 25% of interest costs allowed at basic rate only. This 75% reduces to 50% in 2018/19, 25% in 2019/20, and from 2020/21, all finance costs are given relief at basic rate only. Let’s break down the numbers with two examples. What to do about section 24? 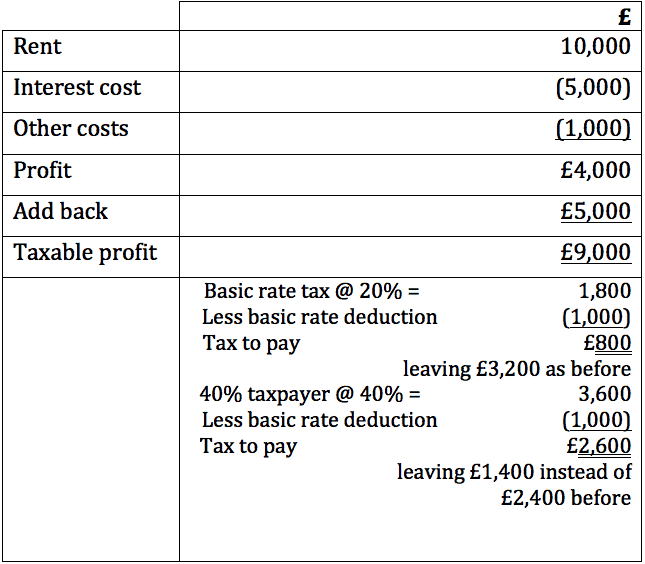 As you can see, while the basic rate taxpaying landlord still has a net after-tax profit of £3,200, the 40% rate taxpaying landlord has gone from £2,400 down to £1,400, a reduction of 42%. And the basic rate taxpayer now has taxable income of £9,000 instead of £4,000 which might push them into higher rates. What to do about section 24? You need to compute the effect on your tax of the section 24 restriction between now and 2020. The more highly borrowed you are and the higher your rental income, the worse off you’ll be, especially if you’re a 45% rate taxpayer. Some landlords will become loss making or decide that the higher tax charge makes the buy to let operation either marginal or simply not worth doing financially. In those cases, you might transfer your properties to a new wholly owned company where the interest deduction is not affected by section 24. But watch out for SDLT, Capital Gains Tax and your bank regarding the need to renegotiate your mortgage loans. You might try to sell your properties, but in many areas, especially London, the market for such properties is dead, and you may have to sell at a very painful discount. Alternatively, you should try to increase the rents you charge in an effort to recoup the greater tax charges you are suffering. If you are thinking about becoming a buy to let landlord, then do consider using a company, but remember another George Osborne invention, namely the 3% SDLT surcharge! For advice in relation to tax and your buy to let portfolio, moving your properties into a company or setting up a portfolio from the start within a company, contact Patrick Cannon today.